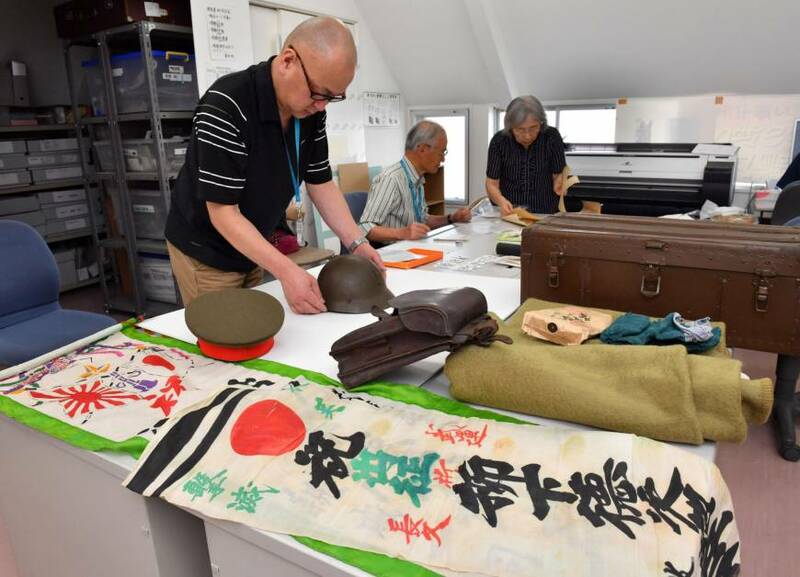 More and more people whose relatives lived through World War II are donating inherited personal items to peace memorial museums throughout Japan. Such artifacts offer a lens through which visitors are afforded view of Japan’s wartime experience. But many museums face difficulties, including insufficient storage space and staff, in accepting the donations. This in turn increases t he risk is that the memorabilia, which have great historic value, may eventually be lost or discarded, prompting some to ask the government and public organizations to step in. 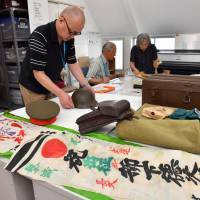 Takashi Yanagishita, 78, from Nagoya, donated a helmet, campaign flag, rucksack and five other items to the Material Pavilion of War and Peace Aichi in June. The items belonged to his father, Tokujiro, who was demobilized in China after the end of World War II. “I could not bring myself to throw them out,” Takashi said. Tokujiro passed away at the age of 47 in 1951 due to complications from an illness he contracted during the war. Takashi was still in sixth grade at the time and never heard the details of his father’s war experience. The museum has accepted approximately 2,600 artifacts from 425 people so far. In the past, about 20 donors on average approached the museum each year, but the number is growing at twice the rate this year and had already reached 32 as of Aug. 10. Despite receiving only items of known provenance, Peace Aichi’s’s storage space, which has a width and length of 2.5 meters and depth of 4 meters, is already filled to the brim with transparent boxes. Similarly, Shiga Peace Museum in Higashiomi, Shiga Prefecture, has received more donations in recent years and its storage space is 90 percent full now. “(The museum) has to either expand the storage space or limit the articles accepted,” said Akiko Hidaka, 36, an archivist for the museum. Keiichi Harada, a professor from Bukkyo University who is investigating memorial sites and museums throughout Japan, said, “there is a greater need to preserve the artifacts for future generations now because the number of people who have personally experienced war is decreasing. Tokyo-based Monjusha Co., Ltd., an editing production company, owns close to 10,000 photos — mostly of the Pacific War. The director of the company, Masao Hiratsuka, 79, looks at the National Archives and Records Administration and the USS Arizona Memorial in the United States as examples. “Their storage space and number of staff they employ are at a completely different scale (than Japan’s). To prevent war artifacts from being scattered and lost, the Japanese government needs to work on creating a system for accepting such donations,” he said. More and more items owned by veterans are now being traded on the internet. Out of consideration for families of the deceased, some are requesting that such sales be banned. However, there are no regulations at the moment, leaving such concerns at the discretion of site operators and sellers. There is also a wide variety of collectibles available, from military swords with a minimum ¥1 million bid price of to belts that go for a few thousand yen. Also available for sale are campaign flags with handwritten messages, private mail, photo albums and others. In response to requests from families of the deceased, the Health, Labor and Welfare Ministry has posted a notice on its website asking sellers to refrain from online auctions of wartime artifacts. During the Upper House Budget Committee session last October, former health minister Yasuhisa Shiozaki announced the government had asked auction website operators to self-regulate. Starting May this year, Yahoo! Auctions began displaying the ministry notice every time a seller tried to auction any war-related items . However, “there are also some people who think that it is better to pass the artifacts to someone who understands their value and can take care of them rather than to dispose of the items,” said one of the PR staff. As a result, the ministry does not have a clear policy to prohibit online transactions. “It is difficult to impose regulations for just online transactions,” a staffer said. According to Fumio Tsujita, 70, a researcher of military history, there are close to 100,000 collectors of old Japanese military memorabilia in the country. Popular items such as a general’s sword get 2,000 to 3,000 views when they are put up for auction. “To family members, those items are precious possessions of their deceased relatives, but to a stranger, they are merely objects, so it is only natural that they end up on the market,” said Tsujita. There is greater interest on Japanese war memorabilia from overseas as well, in particular from China. This section, appearing Tuesdays, features topics and issues from the Chubu region covered by the Chunichi Shimbun. The original article was published Aug. 12.